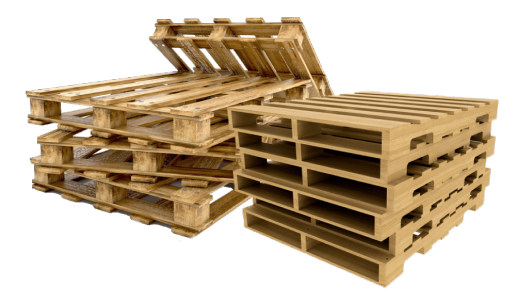 Pallets fall into two main categories, stringer pallets and block pallets. The most common is the stringer pallet. The stringer can have notches (4 way) or no notches (2 way). With notches it is able to be picked up on all four sides the same as a block pallet using a forklift. A block pallet will usually be taller which makes using a pallet jack easier but it also reduces the number of pallets in a stack to fit into a trailer. More material goes into a block pallet making it likely to weigh more, even with lighter-weight softwood. IMPORTANT! When measuring a pallet the stringer (sometimes called the runner) is always the first number. For example a 48 x 40 pallet has 48” long stringers but a 40 x 48” pallet has 40” long runners. This is critical information when asking for a quote.